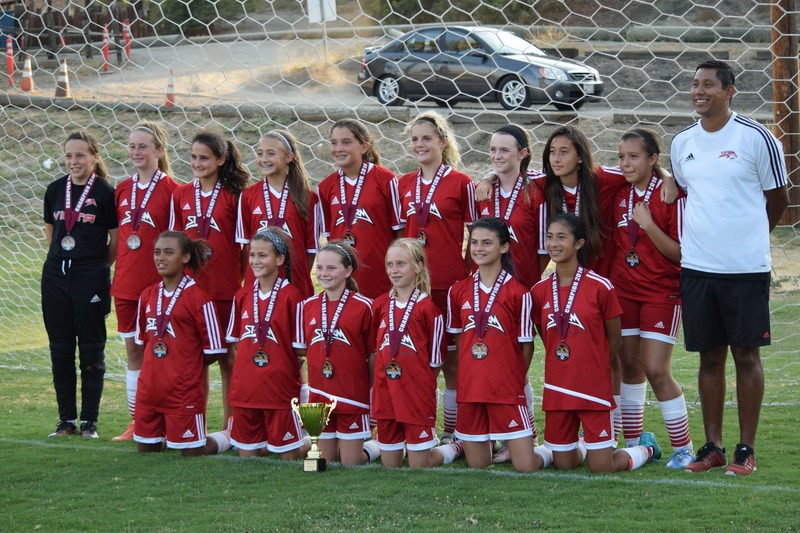 Coach Michael's G04s headed up to San Juan Capistrano to play a premier level bracket in the 2016 South County Showcase. On Saturday morning, Storm took on the Irvine Slammers in their first game winning 3-0. Scoring only one goal by Emily Ralph, Storm battled the Slammers through a tough the first half. Come the second half, Storm was able to keep the pressure high and put away two more goals - one by Ashlinn Limjoco following up a rebound and a third goal by Elizabeth Melcher securing Storm the win. Saturday afternoon saw Storm take on the OC Premier with both teams coming off wins in their first matches. Both teams were hungry to take the lead in the bracket. Storm worked hard to keep the pressure on OC by moving the ball side to side and making penetrating runs with Emily making two break-through runs and taking some shots off target. Intense play from both sides made the game a true nail biter. In the second half, center forward Estella Gladden played the ball out to right wing Fe Garcia-Nguyen and continued her run up the middle and into the 18 yard box. Fe made a pass back to Estella who, while under pressure, was able to create a small window to put the ball in the back of the net giving Storm the lead. Not ten minutes later, with high pressure and a bouncy ball in the back, OC made a toe poke shot putting the ball in Storm’s net and ending the game 1-1. On Sunday morning, Storm faced South Slammers FC. Storm had four tournament points and needed the win to stay in first place in the bracket. The South Slammers, having lost their two previous games, were hungry to get some points. Storm came out strong scoring the first goal in under five minutes with a pass from Emily Ralph to Estella Gladden. Storm's defense kept the Slammers in their own half for about twenty minutes until the Slammers were able to get by and make it 1-1 before the half. With a foul given up by Storm in the second half, the Slammers were able to take the lead and end the game at 2-1. With OC Premier winning their third game, giving them seven points, and Storm having four points, they were set to play each other in the final. a big shot from outside the 18 yard box sending a soaring ball into the back of the OC net. Ending the first half with pressure on OC, Storm was primed to come out strong in the second half. OC played a 3 forward formation that gave them plenty of chances but Goal Keeper Tess Moya came up big having at least 15 saves and stopping 4 1v1s. OC continued to pressure hard getting ten corners in the second half, but Storm was able to come together and win the game 1-0.